In the Wellcome Library in London there is a very fine fifteenth-century manuscript of the Revelations of St John, the last book in the Bible. The manuscript also contains three hundred illustrations and over a hundred religious and medical texts ranging from guides to dying (Ars moriendi), prophecies and treatises on the moral vices and virtues through to remedies, anatomical and gynecological treatises and information on bloodletting. One of these texts is a poem entitled, ‘Behold the world is dying’. Its depiction of human misery is accompanied by a striking image of a peasant laborer digging on a steep hillside. 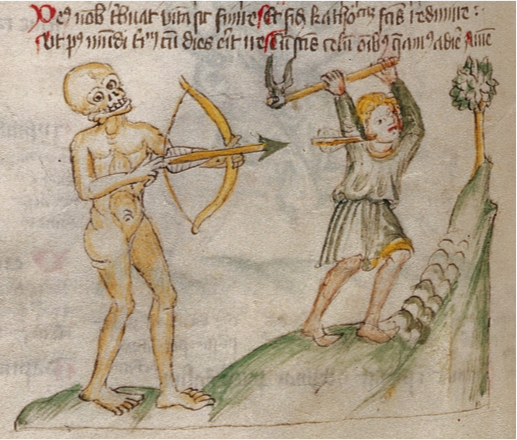 He has been struck in the neck by an arrow fired by a grinning Death. This image has not been studied but it could be possible to do so in relation to the plague, since it may be no coincidence that the arrow struck the man in the neck, one of the sites on the body where the plague bubo was said to appear. 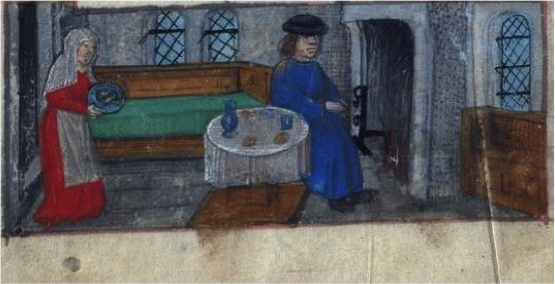 The peasant laborer may have been at greater risk of contracting plague because he was vulnerable to malnutrition. What has not been studied in relation to this image is the nature of his actual labor. Although he is described as a ‘plowman’ in the library catalogue, he is actually doing hard digging with a pick. 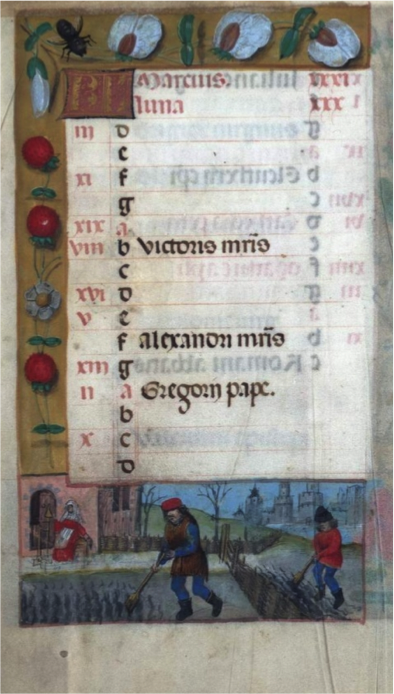 His work is heavier but apparently similar to the roles of peasants in the calendars of many fifteenth-century Books of Hours (a type of seasonal prayer book) for the months of February and March. Could the image possibly hint at an increased occupational health risk of peasants because of their apparent closeness to ‘nature’ out in the fields and gardens of late medieval Europe? 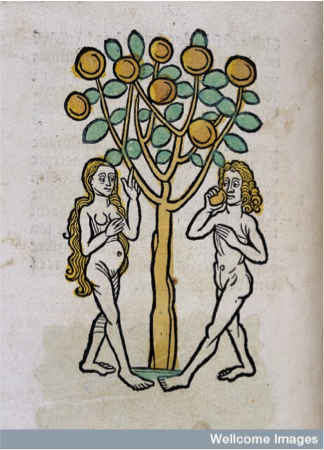 Occupational health is not much studied for the Middle Ages. The few existing studies focus on monks or artisans whose daily routines exposed them to harm: monks and friars were said to be prone to digestive problems, insomnia and emotional stress; smiths, tailors and shoemakers ran the risk of blindness from years of close work or proximity to sparks. Peasants who labored in the fields are rarely seen as running an ‘occupational’ risk. The accidents of laborers’ children have attracted much interest: both coroners’ records and miracle stories describe how children could suffer mishap while their parents worked in the fields. The injuries of the laboring parents have won much less attention, except as part of wider social histories of disability and impairment. Not describing these injuries as occupational health problems might indicate modern prejudices: depending on the time and place the peasant might labor for somebody else as an un-free serf. This work therefore does not fit the modern concept of ‘occupation’, i.e. a job. There may also be a lingering perception that farm labor is unskilled, despite it being the mainstay of agrarian society and forming part of a highly stratified, complex and fluid community. Anyone who has done any farming or gardening knows it to require knowledge and skill, but there may still be a tendency to see this activity as being ‘in nature’ not ‘at work’. Becoming ill during the Middle Ages is perhaps not seen as the result of occupationally hazardous work environments like factories are today. Peasant labor was simply part of naturally hazardous medieval life. The daily lives of medieval peasants can be encountered through miracle stories (a genre now found globally and not just in Christian religion). These narratives were collected at the shrines of saints, often after the pilgrimage of those involved. Shrine recorders no doubt listened to all comers but were selective when choosing what to include in the official record. The cures of peasants, and of women, were usually recorded much less often than those of clerics and knights, although shrines did vary in this respect. We must remember that compilers, who were usually members of religious communities, had individual interests and intentions as well as different cultural outlooks. Different narrative genres also include different kinds of miracles. My focus is on shrine collections, but canonization processes, sermons, chronicles and didactic literature provide other perspectives. 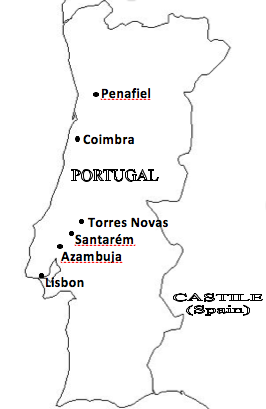 The main miracles I would like to consider come from the Portuguese shrine of Our Lady of Virtues near Azambuja, north-east of Lisbon (see map below). The location became a pilgrimage site after the discovery of a statue of the Virgin Mary in 1403. In 1497, friar João da Póvoa put together a collection of fifty-six miracles, all but ten of which involved healing. Most of the miracles are dated, covering the period 1405–1490. In 1405, Lourenço Viegas from Bezelga near Torres Novas was out harvesting. He tripped on a furrow and fell onto his scythe, which pierced his eye in such a way that it entered his brain. A neighbor found him lying on the ground and brought him home, paralyzed on his right side. Calling on Our Lady of the Virtues, the man recovered before he arrived home (p. 23). In 1408, Gonçalo Anes from Portela near Lisbon was pruning vines when he felt such an ‘air’ that he became paralyzed and blind. They brought him home where he lay for three months until he invoked the Virgin Mary and was cured the next day (pp. 19–20). We also hear of an un-named man who, in 1476, was lifting a sheaf of barley in the region of Coimbra and suffered a rupture in the groin, which we would now call a hernia: ‘his innards wanted to come out, nothing holding them in but skin’ (that is, his intestines were at risk of falling down into his scrotum). He called on the Virgin Mary, promising her a lump of wax and a candle if she should assist him, and he was entirely cured (p. 30). Two of these miracles are typical of the kinds of injuries caused by farm work: wounds from implements and hernias from carrying weights. Hernias can be found in many shrines. Another Portuguese cult devoted to Gil, a Dominican friar and former physician (d.1265) whose shrine was at Santarém, was the focus of two cases of hernia. In one, a man responsible for gathering the royal share of the harvest tried to load up an animal with a huge sack and suffered ruptures on both sides of his groin. He struggled with pain and the shame of disfigurement for fifteen years before turning to the saint. In another, a poor charcoal burner was overwhelmed by shame: ‘while he was working long and hard in order to feed his family, his intestines fell into one side of his groin, so that in the end it happened that he was unable to work in any way to support himself in his poverty’. It is possible in the first two cases from Our Lady of Virtues that the men suffered brain damage, resulting in something similar to what we now call a stroke. But any attempt to diagnose these injuries retrospectively should be done with caution as they lack the specific detail that makes a hernia so obvious in the other case. The concept of an ‘air’ causing sudden paralysis does find a parallel in the same miracle collection. In 1407, a woman called Catarina Antónia from near Penafiel, went one Sunday morning to collect water from the spring for cooking. While washing vegetables, she was hit by a ‘wind’, paralyzing ‘all her left side in such a way that her arm was as long as her leg and it seemed to her that the arm had no bone at all.’ She recovered after invoking the Virgin (p. 21). This woman could have suffered a stroke, but more interesting is the possibility that she was being punished for working on a Sunday, although it is not clear that domestic cooking was seen as work. Women were often depicted spinning in these Books of Hours, but they also served food, reaped hay and harvested crops; they do not usually appear in miracles to have been injured by this work. Men on the other hand were often punished for their lack of belief in the saints’ intercessory powers or their lack of observance for proper ritual. Such stories are common in didactic literature used for preparing regular sermons, probably one of the most important medieval methods for educating people and disseminating the Christian message. In The Golden Legend, a compilation of saints’ lives and miracles from around 1260, a peasant who ploughed on a Sunday had his hand fastened to the hatchet that he used to clean the ploughshare. Another peasant, after hours of harvesting, fell asleep in the field, which gave a snake the opportunity to enter his mouth and belly. Suffering from stomach pain, the peasant invoked St Cosmas and St Damian, better known as the patron saints of medicine and surgery, who caused the snake to escape. Was the issue in these stories inherent laziness and ignorance, or risk brought about from exhaustion and inability to take time off? Or was the peasant naturally closer to the ground, closer to ‘nature’, and unable to rise to greater things? A considerable volume of medieval didactic literature saw peasants as permanently earth-bound, fed by root vegetables and cheaper grains such as barley. Snakes of course have strong symbolic force in medieval religious writing; as do other monsters and poisonous creatures. The miracles of Our Lady of Virtues do not include stories of this kind, but a miracle attributed to Queen Isabel (d.1336), whose cult was based in Coimbra, reports a cure of a woman who had somehow swallowed a leech while collecting water from a spring. She became ‘yellow and dry due to the harm and damage that she suffered from carrying the leech’. It later came out of a nostril. In a miracle of the famous English saint Thomas Becket (murdered 1170), a monastic lay brother was out digging one day when he was spat at by a poisonous toad, causing his face to swell up. While we could consider these cases to be massive allergic reactions, it is also possible to interpret them as demonic attack. Most scholars argue that there is little evidence shrine collections were used for preaching to the laity. It therefore seems plausible that these stories of peasant labor and suffering had a spiritual significance to religious communities, without necessarily suggesting that they did not reflect actual working conditions that led to poor occupational health. Let us end with some reflections on what farming and gardening might have meant in miracle stories and other religious contexts. The ‘peasant’ in these stories may represent a human being in general, who suffers from brevity of life in a world of demonic temptation. In numerous medieval writings, humans were frail, miserable creatures briefly bound to the earth by sin and barely able to acknowledge the gifts of the spirit. The garden, or any cultivated land, represented both earthly paradise and the hard labor to which Adam and Eve were condemned, after having been expelled from Eden. The pious peasant was able to work his or her land, thereby colonizing it in the name of the Lord, but was also vulnerable to demonic tests of endurance and divine punishment for sin. The Bible incorporated the rich Old Testament imagery of gardening, harvesting, grafting and pruning, all of which was later used by medieval authors seeking metaphors for spiritual growth, discipline and fruitfulness. In the early Middle Ages, Pope Gregory the Great set several miracles in gardens as places of moral rectitude where at the same time a demon could lurk in a lettuce. In late Middle Ages, most Books of Hours, the richly illustrated late fourteenth-century Italian manuscripts of the Tacuinum Sanitatis (The Table of Health), and the late fifteenth-century encyclopaedia entitled the Ortus Sanitatis (The Garden of Health), all saw farming and gardening as part of the rightful ‘healthy’ order of the world. No peasant ever rebelled or grew tired and hungry, in contrast to what is known about documented peasants of this period. These literary and artistic peasants hoe and prune quite happily. 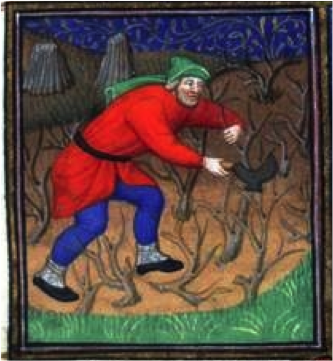 Instead, the image which opened this essay is much darker; here the peasant does not hoe but hacks at the earth. He is not well-clothed or well-fed unlike in most Books of Hours, and unlike in the bright calendars of most of that genre, he is under attack from Death. This therefore was a suitable image to go with a poem about the miserable greed and vanity of humankind. The miracles recorded at the shrine of Our Lady of Virtues undoubtedly reflected the occupational injuries of medieval peasants; there is no doubt that medieval people were aware of the hardship of the poor laborer. Yet they used this knowledge to comment on and critique the more general fate of humans on the earth. Medieval beliefs about the natural world were much more complex than they might at first appear. Iona McCleery is Lecturer in Medieval History at the University of Leeds. Her research focuses on healthcare, medical practice, food, healing miracles, and the social history of Portugal and its early empire. Between 2010 and 2014 she ran You Are What You Ate, funded by the Wellcome Trust (www.leeds.ac.uk/youarewhatyouate), which brought together archaeologists, museum curators, re-enactors and food scientists, using historical food to encourage modern reflection on diet. My research is supported by the Wellcome Trust (grants no. 076812 and 092293). I would like to thank the Wellcome Library and the Brotherton Library, University of Leeds, for permission to use images in their collections. London, Wellcome Library, MS 49, fol 50v; Almuth Seebohm, Apokalypse Ars Moriendi Medizinische Traktate Tugend- und Lasterlehren: die erbaulich-didaktische Sammelhandschrift London, Wellcome Institute for the History of Medicine, Ms 49 Farbmikrofiche-Edition: Introduction to the Manuscript, Descriptive Catalogue of the Latin and German Texts and Illustrations, Index of Incipits (Munich: Helga Lengenfelder, 1995). The English part of this introduction and catalogue is available from http://www.omifacsimiles.com/brochures/cima39.pdf (accessed 16 June 2015). Sharon DeWitte and Philip Slavin, “Between Famine and Death: England on the Eve of the Black Death: Evidence from Paleoepidemiology and Manorial Accounts,” Journal of Interdisciplinary History 44 (2013): 37–60; Pandemic Disease in the Medieval World: Rethinking the Black Death, inaugural journal issue edited by Monica Green, The Medieval Globe 1 (2014), open access from http://scholarworks.wmich.edu/medieval_globe/1/ (accessed 28 May 2015); Iona McCleery, “Getting Enough to Eat: Famine as a Neglected Medieval Health Issue”, in Barbara Bowers and Linda Keyser (eds), The Sacred and Secular in Medieval Healing: Sites, Objects and Texts (forthcoming: Ashgate, 2015). Time in the Medieval World: Occupations of the Months and Signs of the Zodiac in the Index of Christian Art, ed. Colum Hourihane (Princeton: Princeton University Press, 2007); Bridget Henisch, The Medieval Calendar Year (Philadelphia: Pennsylvania University Press, 1999). Julie Kerr, “Health and Safety in the Medieval Monasteries of Britain”, History 93 (2008): 3–19; Joy Hawkins, “The Blind in Later Medieval England: Medical, Social and Religious Responses”, unpublished Ph.D thesis (University of East Anglia, 2011); Angela Montford, “Fit to Preach and Pray: Considerations of Occupational Health in the Mendicant Orders”, in The Use and Abuse of Time in Christian History, ed. Robert Swanson, Studies in Church History 37 (Woodbridge: Boydell, 2002), 95–106. Eleanora Gordon, “Accidents Among Medieval Children as Seen from the Miracles of Six English Saints”, Medical History 35 (1991): 145–163; Ronald Finucane, The Rescue of the Innocents: Endangered Children in Medieval Miracles (New York: St. Martin’s Press, 2000); Irina Metzler, A Social History of Disability in the Middle Ages: Cultural Considerations of Physical Impairment (London and New York: Routledge, 2013); Irina Metzler, Disability in Medieval Europe: Thinking About Physical Impairment During the High Middle Ages, c.1100-1400 (London and New York: Routledge, 2006). Contextualizing Miracles in the Christian West, 1100-1500: New Historical Approaches, edited by Matthew Mesley and Louise Wilson (Oxford: Medium Aevum, 2014); Robert Bartlett, Why Can the Dead Do Such Great Things? Saints and Worshippers from the Martyrs to the Reformation (Princeton: Princeton University Press, 2013); The Cambridge Companion to Miracles, ed. Graham Twelftree (Cambridge: Cambridge University Press, 2011). “Livro dos Milagres de Nossa Senhora das Virtudes Compilado por Frei João da Povoa em 1497”, ed. Francisco Correia, Revista da Biblioteca Nacional, 2nd series (1988), 7–42. O Aegidius Scallabitanus de André de Resende, ed. Virgínia Soares Pereira (Lisbon: Fundação Calouste Gulbenkian, 2000), 511–13, 519–21. Piers Mitchell, “Retrospective Diagnosis and the Use of Historical Texts for Investigating Disease in the Past”, Journal of International Palaeopathology 1 (2011): 81–88. Jacobus de Voragine, The Golden Legend, trans. William Ryan, 2 vols (Princeton: Princeton University Press, 1993), vol 1: 127; vol. 2: 197. Allen Grieco, “Food and Social Classes in Late Medieval and Renaissance Italy,” in Food: A Culinary History, ed. Jean-Louis Flandrin and Massimo Montanari, trans. Albert Sonnenfeld (New York: Columbia University Press, 2013), 302–12. “Vida e Milagres de Dona Isabel, Rainha de Portugal”, ed. J. J. Nunes, Boletim da Segunda Classe da Academia das Sciências de Lisboa 13 (1918–19), 1293–1384, at 1373–4; Pedro de Azevedo, ‘Inquirição de 1336 sobre os milagres da Rainha D. Isabel’, Boletim da segunda classe da Academia das Sciências de Lisboa 3 (1910), 294-303; Iona McCleery, ‘Isabel of Aragon (d.1336): Model Queen or Model Saint?’, Journal of Ecclesiastical History 57 (2006), 668-92. Materials for the History of Thomas Becket, ed. James Craigie Robertson, vol 1 (London: Rolls Series [no. 67], 1875), 383. Rachel Koopmans, Wonderful to Relate: Miracles Stories and Miracle Collecting in High Medieval England (Philadelphia: University of Pennsylvania Press, 2011); Marcus Bull, The Miracles of Our Lady of Rocamadour: Analysis and Translation (Woodbridge: Boydell, 1999). Barbara Müller, “The Diabolical Power of Lettuce, or Garden Miracles in Gregory the Great’s Dialogues”, in Signs, Wonders, Miracles: Representations of Divine Power in the Life of the Church, ed. Kate Cooper and Jeremy Gregory, Studies in Church History 41 (Woodbridge: Boydell, 2005), 46–55. Cathleen Hoeniger, “The Illuminated Tacuinum Sanitatis Manuscripts from Northern Italy ca. 1383–1400: Sources, Patrons and the Creation of a New Pictorial Genre”, in Visualizing Medieval Medicine and Natural History, 1200–1550, ed. Jean Givens, Karen Reeds and Alai Touwaide (Aldershot: Ashgate, 2006), 51–81.